I get a lot of information about my flying by doing an intense post-flight analysis after every flight. I grab the IGC file from the PowerFLARM or the Nano, and upload it to OLC. 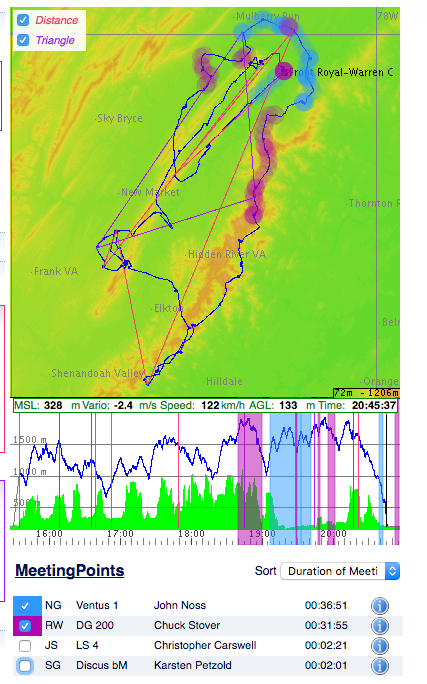 Our flight on Sunday was a really interesting flight with some low saves. When it's a really interesting flight, with some low saves, I'll convert it to a KMZ file to look around at the fields I was looking at in flight. This builds a collection of off-field-landing insights that adds to my repertoire. 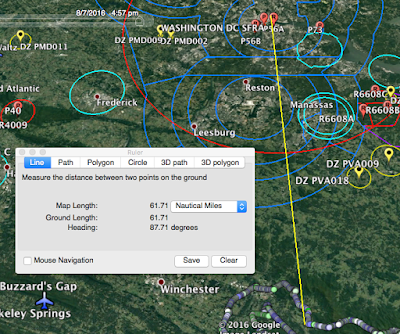 Pull up the KMZ file in Google Earth. By default, the Google Earth shows everything in an absolute top-down view. I find it more useful to look at the flight in a somewhat oblique angle. View everything at an angle in Google Earth by holding down the Alt Key (Windows) or Command Key (Mac), while moving the mouse around on the screen with the left mouse button clicked. Zoom in and out with the Mouse Wheel. 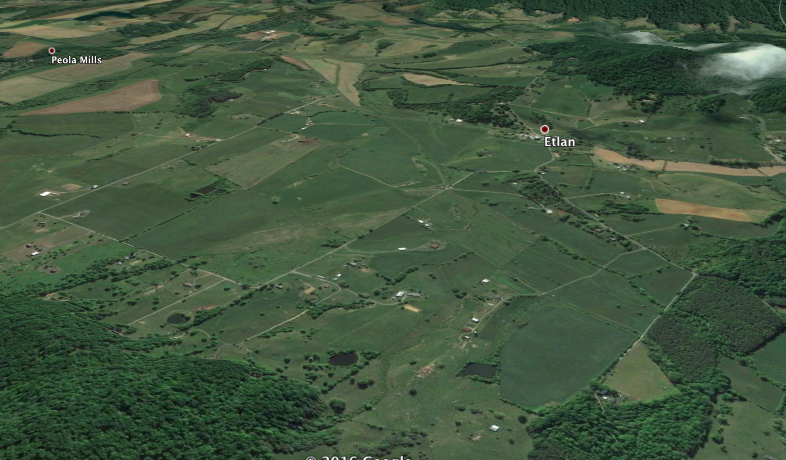 Once you get a feel for navigating around with Google Earth, go find our low point, which was next to the town of Tenth Legion, VA. Each of those blobs are clickable, with the information that was recorded in the IGC file for that datapoint. The field we were looking at -- the one that's at Tenth Legion -- looks like it definitely would have been long and flat enough for us to land in. I wonder what the story is for this field. 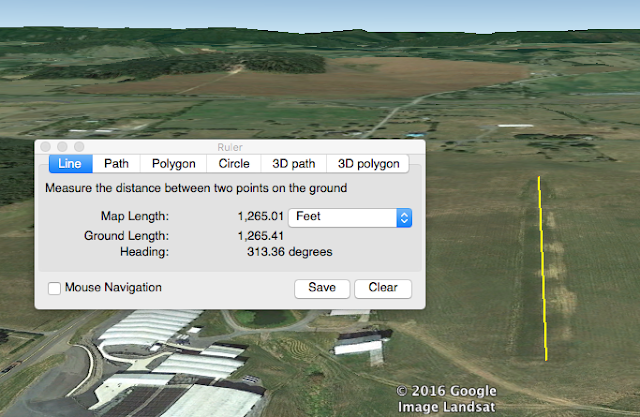 The field is at 1100 feet MSL, at 38º34'35.68"N 78º43'35.66"W.
You can use the ruler tool in Google Earth to give you an idea about relative distances. 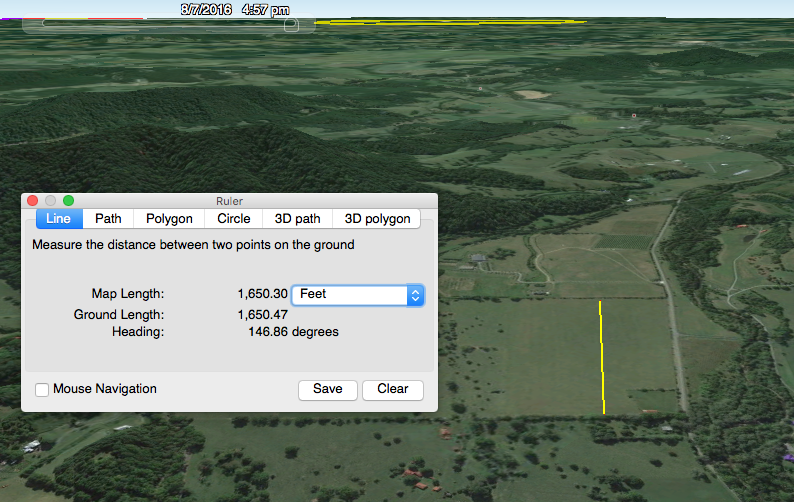 Use it to draw a line on the ground, and it'll measure the distance over the terrain. Let's see if that field sucked, or if it really was long enough for an outlanding. According to Google Earth's measurement tool, it's 1200 feet by 85 feet. It's a good thing that we found this thermal when we did! My "We gotta land if this doesn't work out" spider sense turned out to be right. We were down to 1100 feet AGL over this field I was favoring. Hey! It doesn't look too bad! It looked kind of lumpy to me from the air, but the altitude differences weren't that much around the field. 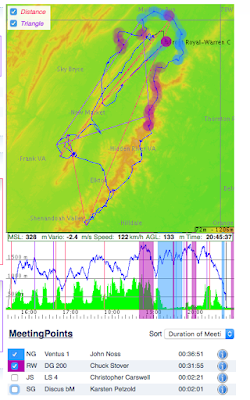 You can figure out the elevation of the terrain by moving your mouse around and looking at the readout for altitude on the bottom right of google earth. The other low save wasn't nearly as low; even though we were in an interesting position. 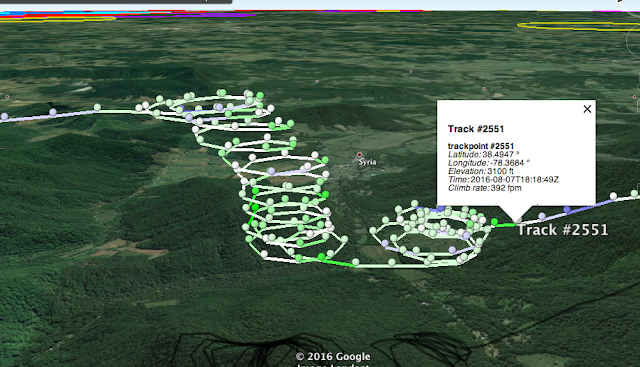 On the Eastern side of the Blue Ridge, near Syria, VA. Low point of 3100 feet MSL. The mountains immediately underneath made it look lower than we actually were. 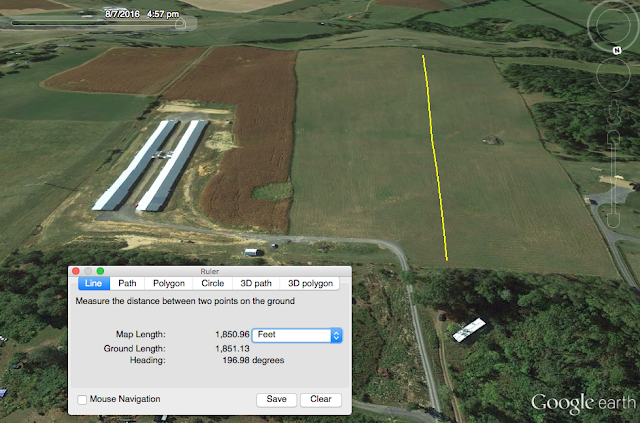 We had a lot of distance we could cover to find more lift or a landout field. While we were seeking that solid thermal to get us out of that mess, the field I had in mind looks pretty good. 1600 feet long, but complicated by trees on the approach. The trees would reduce the usable length of the field, so that's a demerit. Landing it on the diagonal would have given us another 200 feet, which is what I probably would have done. There were many other options slightly to the north, between Peola Mills and Etlan, VA; just east of Old Rag. Here's the crummy photo I took from the iPhone when Romeo-Whiskey was turning too much for a good photo. I couldn't get out the phone in time for us to fly with the Bald Eagle over Front Royal. Finally, there was a really really bright light that distracted us for a while. What the heck was that light? We wondered if it could have been a helicopter with a landing light on it, pointing right toward us. We flew toward it, I turned to the side, and there was no horizontal relative motion; then I turned back toward it. The lack of horizontal movement means it was really far away. Shane quipped "It's a fishing lure", and Chuck suggested it might be that laser that they use to tell an aircraft that it's flying toward FRZ airspace. I found the part of the flight trace and projected the distance out. Projecting the distance out... it's pretty much right over the middle of the city. I wonder if it was a building that was just pointed out the right way, reflecting all of its glass at us, or if it's really something more laser-y. It's conceivable that it was a building in Rosslyn. Not likely to be Tyson's Corner. It could have been a glass building at Reston Town Center. I don't think it was the FRZ laser system. That's supposed to flash red-green-red-green. This was a solid bright yellow-ish white. I bet it was some perfectly aligned building. If I had some photos of the light, I could probably figure out which building it was with some triangulation, while using the GPS information. One of the cool functions of OLC is showing where you were flying with other gliders nearby. 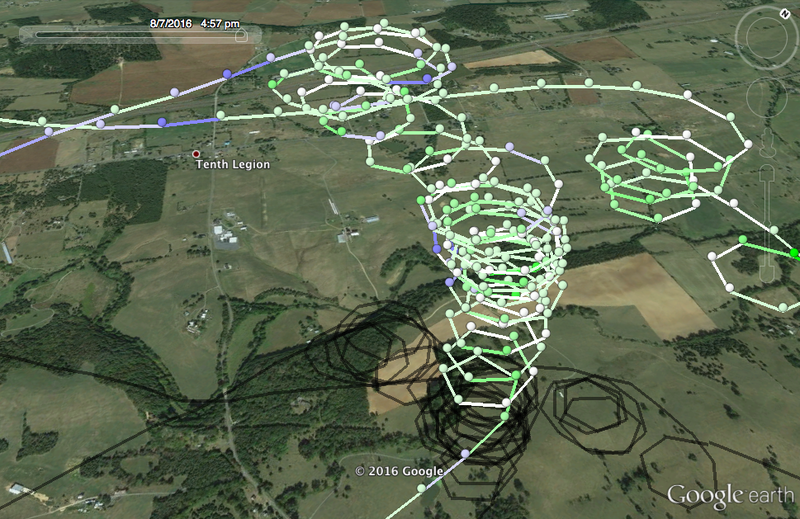 Here, on our flight trace, you can see Romeo Whiskey following us along the blue ridge, and November Golf flying around us after we flew with that Bald Eagle over the town of Front Royal. I hope you enjoyed the flight and found it to be educational and memorable. 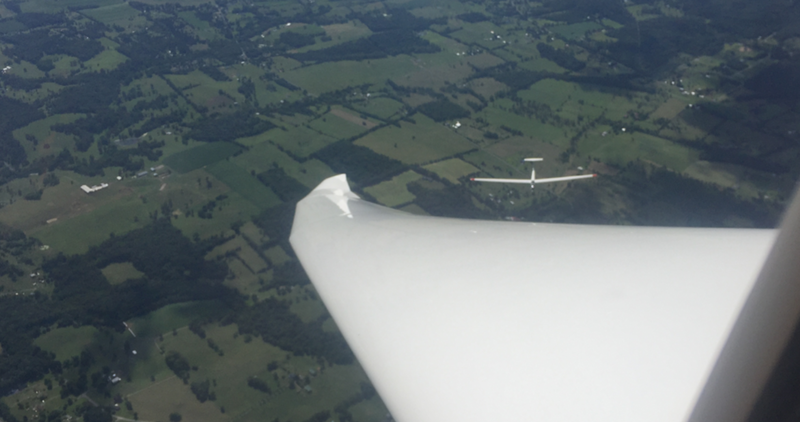 I hope it gave you some sort of idea why cross-country soaring is so much fun -- way more fun than grinding about, around the pattern all the time. Delightful vicarious experience for the rest of us to digest and apply.